Check out our new Product Information Sheet on ENMET’s wide range of products designed to meet medical air systems requirements in hospitals and medical facilities. These products include medical verification instrumentation, compressed airline monitors, single and multi-gas detectors along with ambient air oxygen monitors used in MRI rooms and other areas in the facility to monitor oxygen levels. Many of these medical air monitoring systems are designed to ensure compliance with NFPA 99 Medical Air Systems Guidelines and OSHA monitoring requirements for Grade D breathing air. 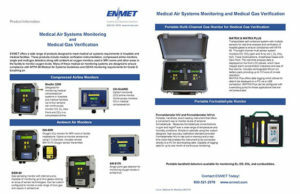 Contact our ENMET Sales Team today for more information on our Medical Air System Products.